Commuting in a busy city like San Francisco can be annoying — between all the cars, bikes, Boosted Boards and other electric gizmos zipping and weaving through lanes. 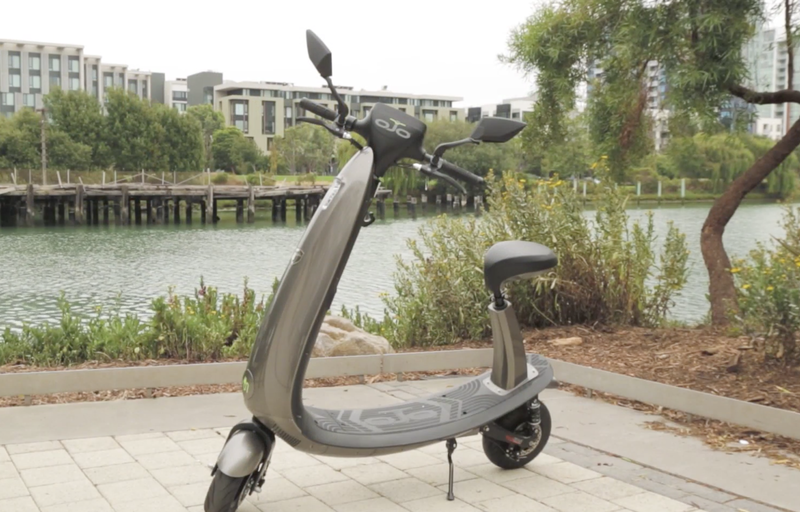 The Ojo Electric scooter, while it might help with your personal traffic woes, won’t do much to help reduce the overall annoyance commuters experience. The Ojo is designed to be an alternative mode of transportation for when you’re traveling too far to bike and too close to drive, Ojo Electric co-founder and president Dale Seiden told me. It goes up to 20 mph and can travel 25 miles on a single charge. They were wrong and I was right (clearly), but I don’t blame them for thinking I wasn’t supposed to be there. In San Francisco, scooters that go over 20 mph are not allowed in the bike lane, but there was no way for them, or anyone else, to know that. Other than the severe shade I experienced, I had a great time on the Ojo. It’s sturdy, the Bluetooth speakers sound great, it can get up hills — slowly but surely — and it’s fun to ride. The Ojo is also super easy to charge with a retractable cord that plugs into any standard power outlet. Parking and storing it, however, brought up its own challenges. The Ojo has a motion-activated alarm system, which means that if someone even touches it, a super loud alarm will go off. I tested it and it works well, but I still felt nervous leaving it outside for too long unattended. That meant when I got home for the night, I had to drag it up the stairs and inside my small apartment once I was done riding it for the day. It was pretty annoying because, weighing in at 65 pounds, the Ojo is not easy to bring up stairs for safe-keeping. Seiden told me after the fact that I could put a bike lock on it and leave it outside, but I would still worry someone would just cut the lock, throw the Ojo in the back of a truck and deal with the alarm later. Ojo is currently working on a more robust scooter that can safely ride along with cars, going 35 mph, and plans to explore a type of scooter-sharing solution. It’s not clear how much that version will cost, but it would need to be less expensive than a standard Vespa-like scooter, which costs upwards of $3,000. But competitors like Scoot Networks in San Francisco and Gogoro in Taiwan and Berlin are already tackling this space. In March, Scoot launched the Scoot Mobility Operating System to offer a white-label service to cities that may want to operate Scoot-like mobility systems. Gogoro, on the other hand, earlier this year expanded its electric scooter-sharing program in Berlin, making a total of 1,000 available in the city. “All of these cities are starting to go to sustainable, green, eco-friendly transportation and that’s really what we’re all about,” Seiden said. In order to further expand, Ojo plans to partner with a “large mobility company,” Seiden said. My bet is that it’s Ford, given its push into alternative forms of transportation with its new bike-sharing program in the San Francisco Bay Area and its acquisition of shuttle startup Chariot. Seiden did not confirm nor deny my theory. You can buy the current model of the Ojo commuter scooter for $1,999.99. But if I were you, I’d wait at least until we see what the next version looks like. To hear more from Seiden and watch me whip and nae-nae on the Ojo, check out the video below.